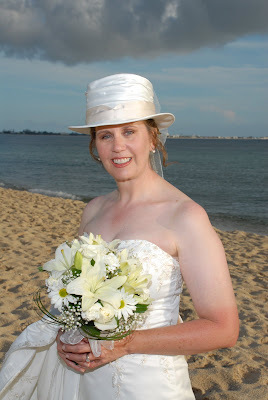 I have spent a lot of time today learning about wedding flowers, and the latest wedding floral designs. I thought I would share some of this with you. 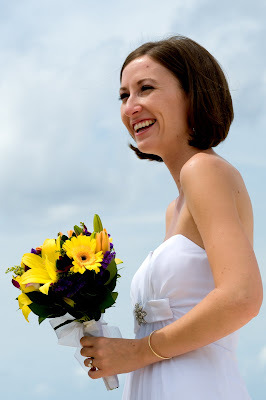 By far the most popular bouquet our brides request is the "Tropical" included in the Cayman Wedding packages. This does not mean you get the same bouquet as all the other brides in a week or a month. The Tropical still gives you some flexibility in colour and in blooms. 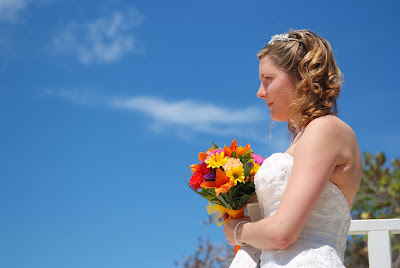 This bride wanted more yellows, like lilies and yellow gerbera daisies. 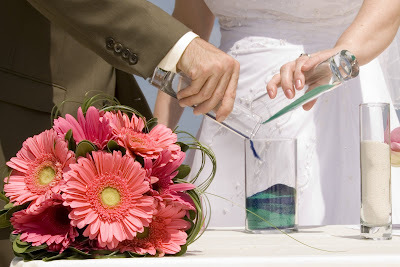 This bride's request was for a b0uquet comprised of pink gerbera daisies. 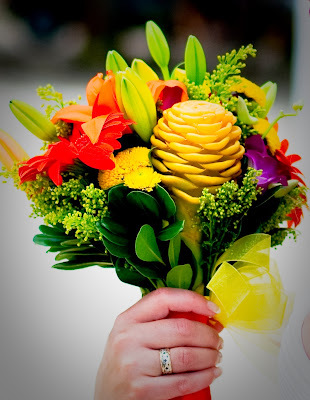 Oranges and yellows make this tropical bouquet perfect for a beach wedding. This tropical multicoloured has some exotic blooms like birds of paradise (psittacorum). Other exotic blooms often requested are anthuriums, pincushion protea and ginger flowers. I really loved this bouquet but I can't name all the flowers, what I like about the florist we use, Trisha's Roses is that the flowers are always fresh, and the designers are great. 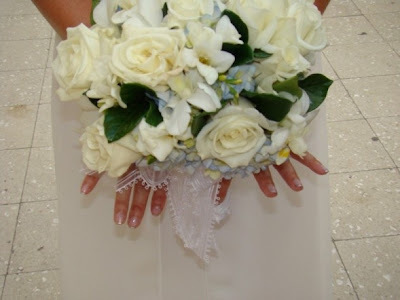 I very seldom get a bridal bouquet I'm not 100% satisfied with, and they will always fix it if I'm not happy. Another tropical hand tied bouquet. You can colour coordinate the silk ribbon. 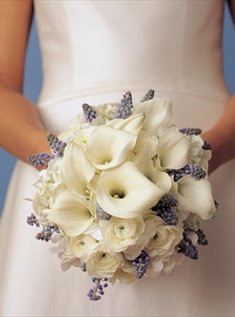 This was a special order all white bouquet with lilies, daisies. roses and baby's breath. This bride flew in her own florist who brought these french garden roses, cymbidium orchids, and other pink toned orchids, pulled together with bear grass. 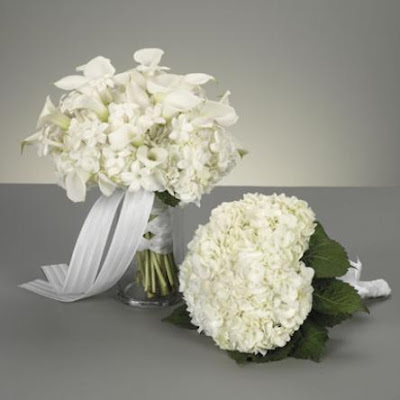 This season;s hottest floral tip, let the "something blue" be blue flowers in your bouquet, here blue hydrangea with white roses and stephanotis. Simple. classic wedding florals, left white miniature calla lilies with stephanotis, right white hydrangea. Take the "something blue' to the extreme with this special order bouquet of ranunculus, white calla lilies and muscar ordered from Holland. 1. For your first anniversary, don't bother with traditional top-layer of your wedding cake, ask your florist to recreate a miniature vase arrangement of your wedding bouquet flowers...what a beautiful reminder of your special day. 2. Can't decide what kind of flowers to get for your mother-in-law. mother or grand-mother? Get a hand-held corsage with just a few blooms which complement the colour and style of your own bouquet! 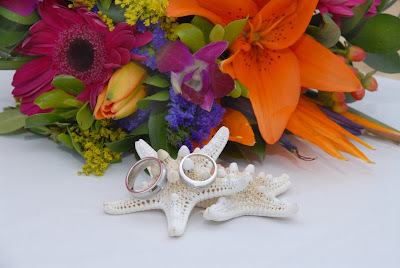 All our wedding florals include a matching boutonniere for the groom. If you're interested in wedding flower design check out "To Have and To Hold" a book on magical wedding bouquets authored by David Stark and Avi Adler published by Artisan Books. Or pick up "Wedding Flowers" from Better Homes and Gardens Creative Collection available on magazine racks now.